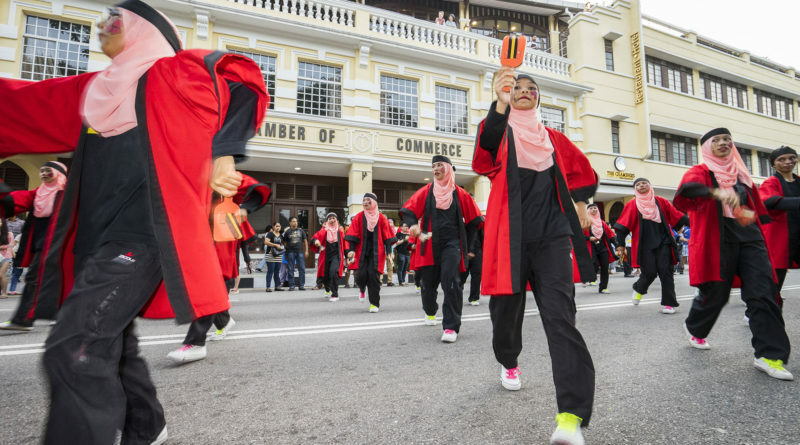 The Penang Yosakoi Parade is just around the corner! It was launched in 2013 in direct response to the generosity of the people of Penang. In 2011, when the Tohoku Earthquake hit Japan, the members of the Pink Hibiscus Club decided that they wanted to help raise funds to help the victims in Japan. In 10 days, they organised a fundraising event that saw thousands of Penangnites turning out to donate through the “Penang 4 Japan” initiative. Thanks to the people of Penang, the organisers were able to send over 1.6 million ringgit to Japan through the Japanese Consulate. Overwhelmed by the generosity and show of sympathy, solidarity and support for the people of Japan, the Pink Hibiscus Club worked to repay the kindness by creating an event that used ideas from Japan to help the Penang people showcase their creativity, talent and generosity. The event became known as the Penang Yosakoi Parade. 2017 is the 4th time the event is held and it coincidentally falls on exactly on the 6th Anniversary date of the Tohoku Earthquake ~ March 11th. The event is co-organised by Pink Hibiscus Club with the MBPP, Malaysia Cosplay Toshokan and is supported by the Penang Global Tourism and the Penang State Government. 6:30pm Parade to Start… Lots of interactive stuff for the audience to participate while watching the parade. Singing Competition – listen to the original and download the karaoke version to practice for the “Penang ~ Island of Love” singing competition! Charity Food Fair and Demonstration of fusion Penang-Japanese food – Exchange your PYP Flyer for a ‘Buy 1 Free 1″ Food Voucher! Games, Kimono, Craft stalls to play, try and buy from! Mizukake Mikoshi where you splash water onto the passing Mikoshi. The audience gets to vote which dance team is the HAPPIEST dance team! PLUS the regular Cosplay, NGO and other colourful display of Penang’s finest.